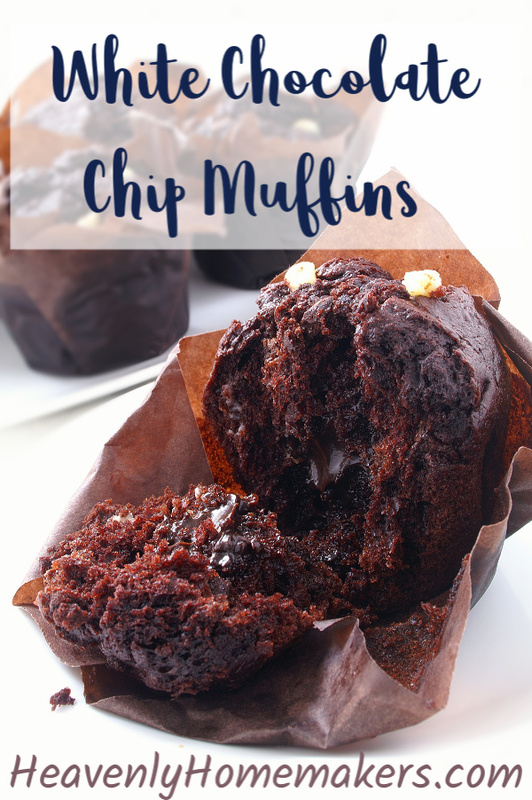 My Chocolate Chocolate Chip Muffin recipe has been a family favorite at our house for years and years. One day I decided to make them extra special by subbing regular chocolate chips for white chocolate chips. It’s a simple, genius idea, taking these muffins from something special to something even more special! Ahh, life’s simple pleasures. Get ready to give these Easy White Chocolate Chip Muffins a try! Scoop Muffin Mix or measure dry ingredients together in a bowl. Add egg, sour cream, milk, and melted coconut oil, stirring until ingredients are combined. Scoop batter into 12 prepared muffin tins. Bake in a 400 degree oven for 20-25 minutes or until a toothpick inserted in the middle comes out clean. 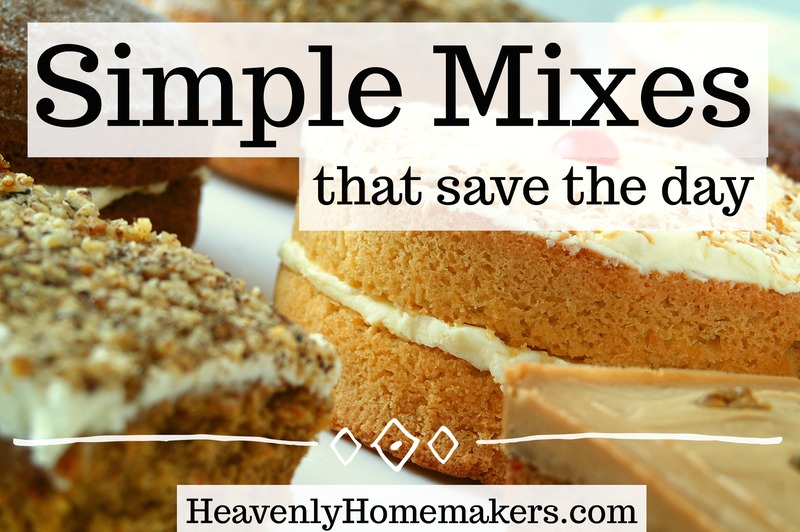 **Do you have our Simple Mixes to Save the Day eBook yet? Grab it so you can save time and energy by using the Muffin Mix for this recipe!! I LOVE having these mixes on hand!!! Get our 7 amazing whole grain, low sugar mix recipe - from brownies to breads! Use them to make 22 varieties of delicious, simple baked goods for your family and guests! Be sure to grab white chocolate chips from Olive Nation and take advantage of the 20% discount they offer! (Use the code home at checkout for the discount.) 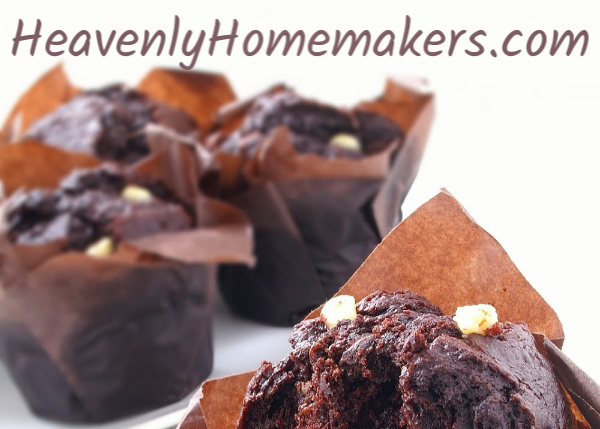 And while you’re there, pick up some of their cocoa powder to go in these muffins. It is so good!! Wanted to see if I could have you double check this recipe? I made them and they were flat like a brownie. Are you sure only 1/2 teaspoon of baking powder as leavening? Just wanted to check this out because they look oh so divine in your picture but mine were … not so much LOL. Thank you! Love your blog so much these days! Love the simple and healthier recipes! Shucks! I do just use 1/2 t. of baking powder because I’ve found that when I lower the sugar content, the leavening can taste too bitter if I use too much. BUT you may have a different experience and find that 1 t. of baking powder is better and not bitter!